A truly red banana! The leaves are red with a hint of bronze and chartreuse green flecks and blotches. The trunk and leaves of this exotic tropical are burgundy with irregular iridescent lime green variegation in the foliage. Siam Ruby is so colorful, you have to have it! 'Siam Ruby' adds dramatic color to any garden setting, also looks stunning all alone. You are bidding on live bare root seedlings with vigorous root systems * inches tall with * leaves born and grown in Hawaii. 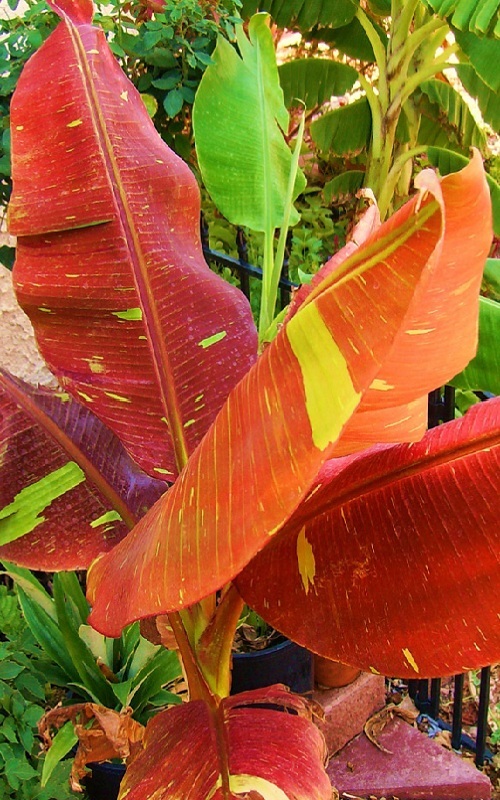 Musa ‘Siam Ruby’ is a spectacular and unique ornamental banana cultivar with beautiful ruby red leaves which are sometimes speckled with random small specks of chartreuse green. ‘Siam Ruby’ screams for one’s attention and makes an excellent focal plant in any tropical garden. Leaves of ‘Siam Ruby’ are held at a slightly higher angle than most other Musa plants. Discovered growing in the wild in Papua New Guinea and is most probably a sport of Musa acuminata ‘Tapo’. 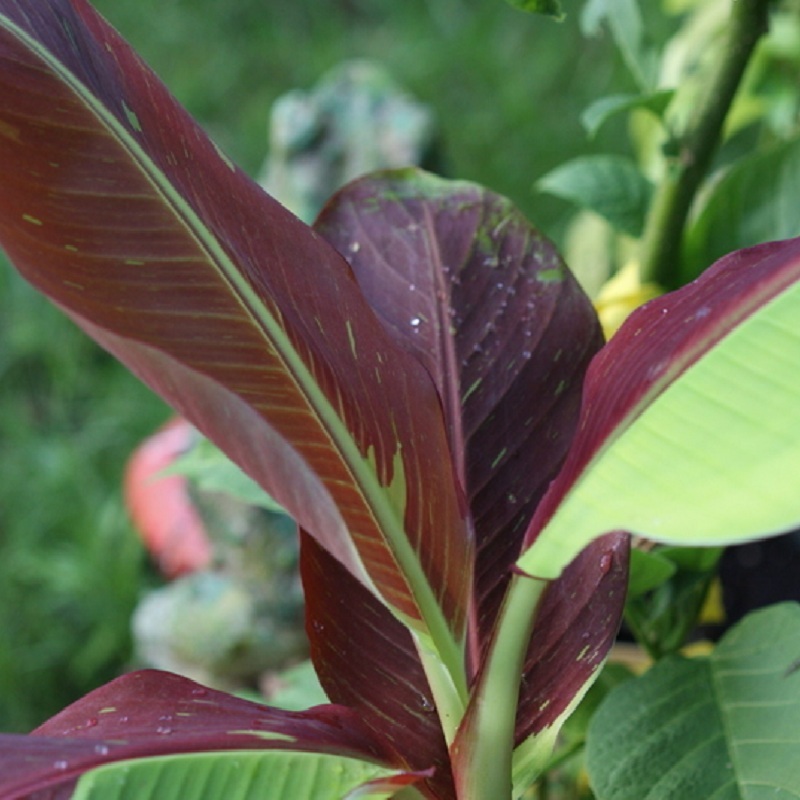 When it was first offered for sale via online nurseries, this ornamental banana cultivar was referred to via two other cultivar names, namely, ‘Palawan Red’ and ‘Ace of Hearts’. It took some time before everyone settled for the cultivar name 'Siam Ruby’. The leaves are a stunning, dark ruby red with tiny green flecks...the more sun, the more intense the color. This is one banana that loves intense heat and humidity. 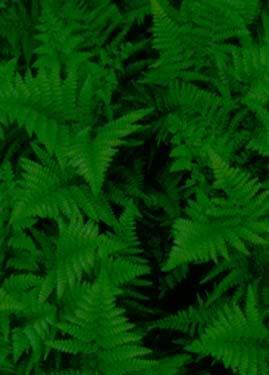 Young plants are bright green with red highlights. ‘Siam Ruby’ starts to develop the red colors at about 12 inches tall. 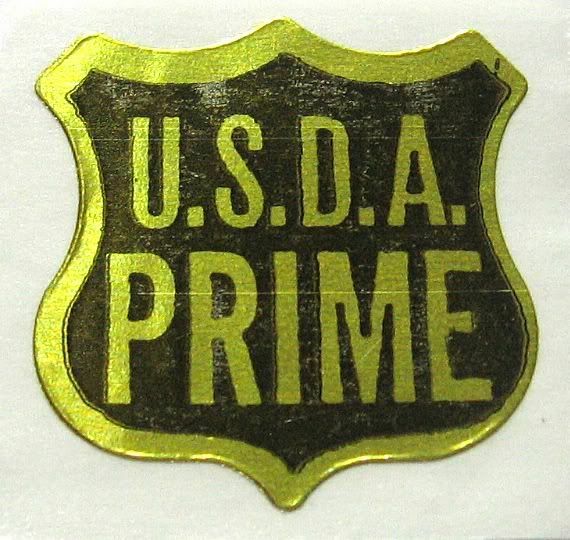 Stronger light will bring out brighter, stronger red colors and better contrast with the occasional green variegation. As a small plant Siam Ruby is more golden yellow and hints of the red to come. It will develop that rich vibrant color before you know it. 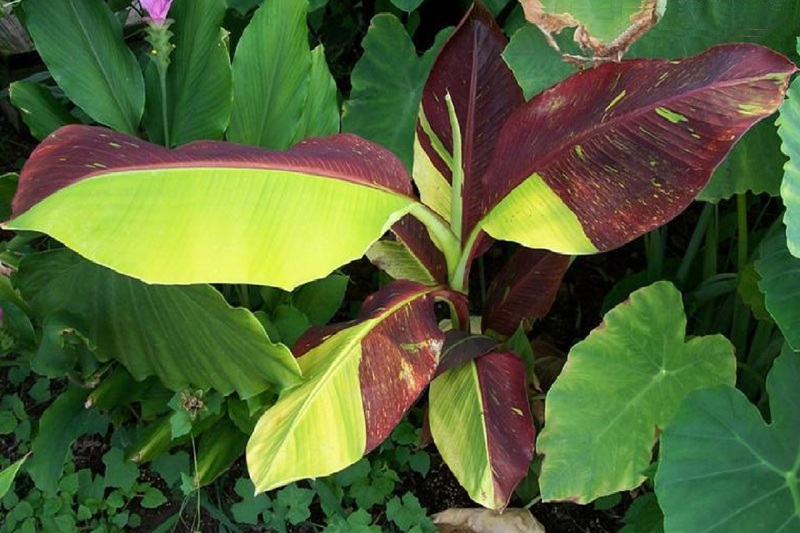 This dwarf banana astonishes with its giant wine-red foliage speckled with lime green splotches and stems of claret. As each leaf unfurls, there is a surprising new pattern variation. This standout lends tropical flair to the garden without overwhelming it. Cultivated as a sport of Musa 'Tapo' in Papua, New Guinea, and brought to the U.S. only three years ago, it is magnificent in large pots planted with smaller complementary foliage and flowering plants. This Indonesian native thrives in summer's heat and humidity. This banana cultivar seems to produce suckers quite prolifically. New suckers that emerge have leaves that are often less red in colour and feature a prominent yellow mid-rib and veins. The leaves of the young plant are more comparatively narrower and have a sharp leaf tip. 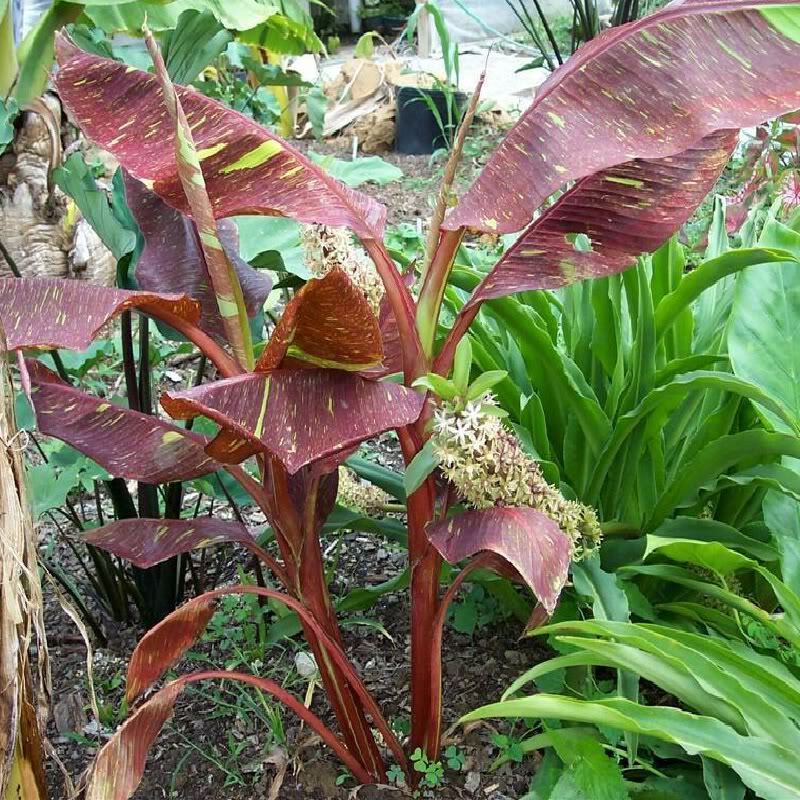 Unlike other bananas, suckers of ‘Siam Ruby’ are best taken from the parent clump and allow to establish first in a pot of fertile, well-draining soil before transplant to a spot in the garden. 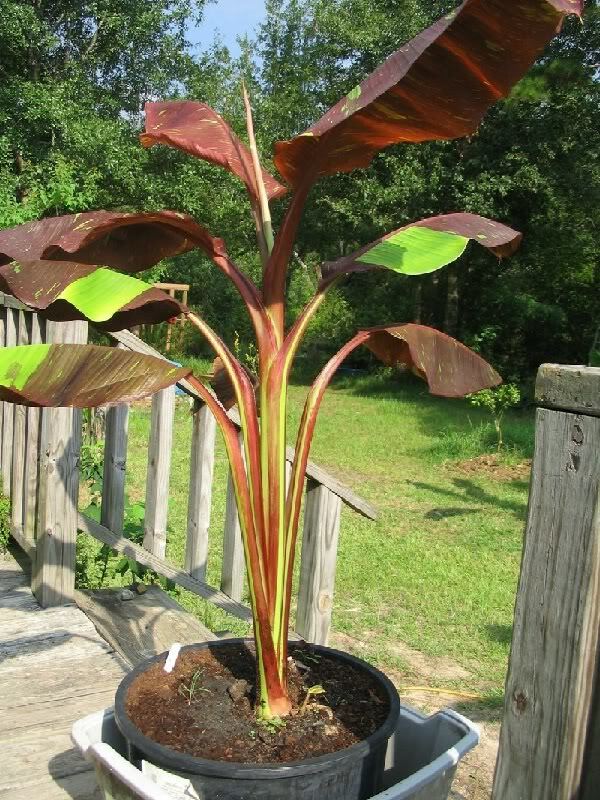 ‘Siam Ruby’ is not an easy ornamental banana plant to grow. Note that drainage is exceptionally important to this particular banana cultivar, otherwise plants can rot at the base. It thrives under full sun so that leaves take on an intense ruby red color. Also, avoid letting the leaves become injured as broken parts can become infected easily. Hence it is recommended to space other plants apart from ‘Siam Ruby’. Clumps tend to become quite crowded rather quickly and hence thinning of suckers need to be performed periodically. Like all other bananas, ‘Siam Ruby’ prefers to be grown in fertile soil that is rich in organic matter. Mulch plants with well-rotted compost to keep roots moist and cool. 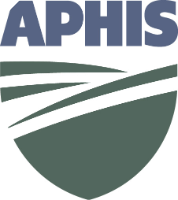 Feed with organic fertilizer that is also rich in potassium. Fertilizer: All bananas are heavy feeders. Provide plenty of water and fertilizer during growing season. 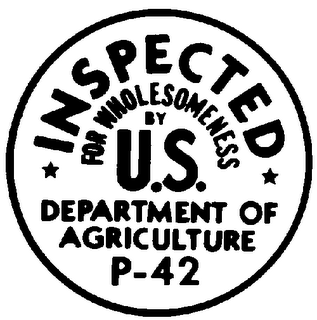 Recommended 6-2-12 fertilizer.